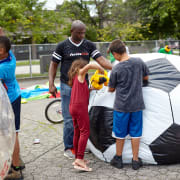 Recess Cleveland is a nonprofit program that creates safe spaces for play during our pop up "recess" events at schools, community gatherings, and private events in and around Northeast Ohio. We use fun creative intergenerational games to promote physical activity, encourage community participation, and engage families. Our goal is to get children (and some adults even) off of their cell phones and interacting with their neighbors during our pop up kickball, soccer, dodgeball, et cetera games around the city. We need volunteers to help with event set-up, referee the games, register participants, ensure the safety of attendees, event takedown, and to sometimes cook. More and more kids are electing to play games on their electronic devices instead of taking advantage of opportunities to exercise, interacting with other kids, and enjoying the great outdoors. At the same time, 50% of schools no longer have recess. We must do something! As kids, games played at recess were a way to make new friends, learn discipline, exercise, improve your negotiating skills, strengthen your leadership skills, showcase your athletic talents, and resolve conflicts. This summer, Recess Cleveland will host over 50 FREE events all over the city of Cleveland. And we hope to attract over 10,000 people to our events over the course of the year. Would you recommend Recess Cleveland?